My kids are enthralled with the Wizard of Oz. Did you know that there are eighteen Wizard of Oz stories? Sixteen are books, one is a set of comic book stories and the other is a book of short stories. Some of the names are very similar which creates a bit of confusion. The book in the picture is "Dorothy and the Wizard in Oz." This is a different story than The Marvelous Land of Oz and The Wonderful Wizard of Oz. Here is a list of the works. Each of the stories introduces fantasy lands and intriguing characters. Belina is a yellow hen that can talk. Polychrome is the Rainbow's daughter. In the land of the Mangaboos the people are made of vegetables and live in glass houses. The characters typically have interesting adventures while exploring new lands and usually end up in Oz. What I like best about these stories is the rich language and the descriptions. They make the imagination soar. The descriptions are so visual the children have been listening and coloring non-stop. We have been downloading the stories from Librivox onto the iPod and listening to them in the car. I like them just as much as the kids. This year I found a successful science formula that really works. Over the past six years we have learned about science in many different ways. We read living books about animals, did science in the kitchen experiments, observed animals and tried to keep a nature notebook. With each method we have learned. The one thing we haven't tried was to follow a science curriculum. To be honest, I haven't seen one I really liked, so I just never bought one. The topics the kids have learned the most about have been covered over the course of several weeks incorporating the five steps below. Not all five steps have been completed with every topic, but when they were, the kids seemed to learn the best. This year the older kids, ages 9 and 11, focused on The Human Body for the entire year. Once Upon a Time Life is the video series they watched. My six year old loved the series. All of the reading came from the book The Way We Work by David Macaulay. I had the older kids read this book slowly on their own, but my youngest didn't do any reading as this books was far too difficult for her. Occasionally they wrote about the science topic. So far I have written about all of our cell projects and up to Week 8 - Teeth for the Human Body portion. The links are all on my Science Page. When my eleven year old was seven we followed this method to learn about birds. We didn't watch any movies, but read many books. The best being The Burgess Bird Book for Children . The activity of observing bird banding is what sparked the interest in the study, and it was followed up with the creation of a lapbook. I believe this method will work with many different topics. Next year I'm planning to cover Earth Science. I'm so excited that I've begun watching, noting and organizing many videos on the topic. I have an Earth Science board on Pinterest where I note blogger's projects that will go well with our year long study. I haven't sought out too many books yet, but I still have a long time to plan, so that will come. I would love to find one living book to cover the entire unit like I did with the Human Body. If you know of one please let me know. Here are some more thoughts on the subject of science from the Homeschool Help Series Bloggers. Please come back next week when we will write about our favorite apps and educational websites. Scratch is computer programming language created to help kids learn computer programming skills. It's free! There are some excellent tutorials available on youtube that provide lessons and ideas for using Scratch. In this tutorial, users learn to create if statements which are tied to keyboard strokes. My kids had an assignment to watch the video and then create a program which employed the skills in the tutorial. My daughter created Falling Ball Competition. It's a two person game. When the falling balls reach the corresponding balls at the bottom of the screen the competitors press a key on the keyboard to earn a point. If the keyboard key is pressed before or after the balls are in contact the competitor loses a point. The player with the highest score after 48 balls fall is the winner. 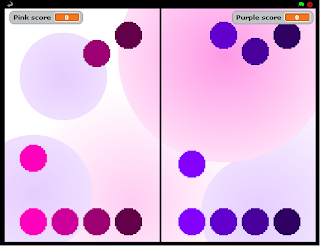 The pink balls are controlled with the keys a,s,d and f. The purple balls are controlled with the keys h,j,k and l. To try the game click on the Falling Ball Competition link above. To play her game click Falling Ball Competition. Week 9: We created a pulley system like one that may have been used to water the Hanging Gardens of Babylon. There are three different types of simple machines. Last week we studied The Hanging Gardens of Babylon, and created an Archimedes screw which may have been used to water the gardens. Another possible way the gardens may have been watered is through the use of a pulley system. This week we created our own pulley system. The goal was to use the pulleys and materials on the left to lift light-weight balls from the base of the stairs to the blue Ishtar Gate. One problem became evident right from the start. How would the portion of the string with the cup attached pass through the pulley? The kids solution was to use a building toy with wheels instead of the provided pulleys. Several designs were explored and tested before arriving at the final design. Another issue was getting the pulleys to stay in place. The kids used tape. My husband would have used tape too. It worked. Finally the found a solution that worked. This project took the majority of the afternoon to complete and was a lesson in engineering as well as working together. When it was finished they were so proud and I was very happy it worked out. To see our other history activities please visit our history page. I like cooking simple foods with the kids. That way they have several dishes they can prepare on their own and can even prepare a meal for the family. Quesadillas fit into that category. Quesadillas are like grilled cheese in a tortilla. Slicing cheese, oiling a pan and frying the tortilla filled with cheese is all there is to it. Onions, tomatoes, peppers, avocados could be added to the quesadillas if desired. He served his with guacamole and salsa, then added the recipe to his personal cookbook. Most local homeschool groups offer park days, field trips, co-ops, mom's night out and support. If I am homeschooling I will be a member of a local homeschooling group. To me it is a must. At a minimum I will be connected on-line, but I prefer meeting others face-to-face. Homeschooling moms are full of information. Curriculum options such as Sonlight, Enki, Abeka, and Ambleside On-line as well as the methods with which they align have become familiar to me through homeschooling groups. Book recommendations, and parenting advice can be obtained through groups. 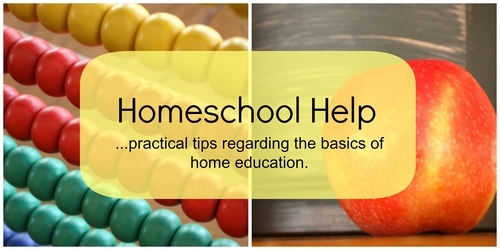 I learned about the Waldorf Homeschooling Method and borrowed homeschooling how-to books from local homeschool moms. Finding great local places to go just happens by participating in local homeschool groups. We visited our local rail bike tour, alpine slide and freilichtmuseum after learning about the activities from homeschool moms. Our best friends have grown through participating in homeschool group activities. This is post number 10 in the Homeschool Help Series. Please come back next week for the topic of Science. Chareen at Every Bed of Roses - Where do you get your homeschool support? Week 7: We made teeth. Our symmetric mouths are filled with pairs of teeth. There are eight incisors, four canines, eight premolars and twelve molars in full grown adults who still have all of their teeth. After reading about teeth in The Way We Work we did some teeth activities. First we counted our teeth and found out that both my six and nine year old had twelve teeth on the top and ten teeth on the bottom. My eleven year old had twelve on both the top and bottom. I had fourteen teeth on the top and bottom. Next we read some stories and watched a very cute video. One Morning in Maine is a wonderful children's story book about a little girl who loses her tooth and goes on an adventure with her father. She learns that birds do not have teeth, but dogs do and theirs fall out just like people's. Throw Your Tooth on the Roof is about what children in different countries do when they lose their baby teeth. Some put them in boxes for a fairy, some have them plated in gold and made into jewelry and some throw them on the roof. This story is a fun way for kids to learn about other countries. Once Upon a Time Life - Mouth and Teeth is a wonderful children's animated video. In the episode the teeth bacteria try to work their way into the blood stream by making a cavity in a tooth. They select the best spot, have a difficult time drilling through the enamel and crave sugar. I highly recommend watching. Next, we made our own teeth. We talked about the shapes, parts and purposes of our different kinds of teeth while we made them out of dough. Incisors are in the front and flat. Canines are used for ripping and very pointy. Molars and premolars are for crushing. A toothpick was inserted into each tooth to make a hole for the root. The roots were spaghetti noodles. We used nail polish to paint the hard, bright, white enamel onto our teeth. Then we gave one tooth with several cavities a crown. Another tooth had a cavity which was filled with yellow dough. To see more of our human body activities please visit our science page. There are many more human body science activities to come, but I'm going to take a break and post some other activities over the summer. This series will resume September 1st with posts on the nose, digestive system, liver, pancreas and other anatomy activities. Week 8: We made an Archimedes Screw. The Hanging Gardens of Babylon were one of the seven wonders of the ancient world. Built during the second Babylonian Empire, the legend says that the gardens were a gift from Nebuchadnezzar II to his wife. There are several mysteries about this ancient wonder, but one has to do with water. One theory says that the gardens were watered using Archimedes Screws several hundred years before Archimedes, the Greek inventor of the Archimedes screw lived. An Archimedes screw is a simple machine used to lift material from a low point to a high point by increasing the distance thereby lessening the steepness. This Archimedes screw is located at the Playmobil Fun Park in Germany. Kids can spend hours moving material around in this play pit. Our Archimedes screw was much smaller. We followed the instructions in the Walk Beside Me blog to create our Archimedes screws. We began by cutting a hole and the end off an empty water bottle. Then we cut six circles out of stiff paper to fit inside the water bottle. A slot was cut in the circles and they we put onto a skewer. Next they were taped together to form a spiral. The spiral was stretched out and taped to the skewer to be held in place. The screw was tested with cereal. It had to be modified several times before it worked. There were many issues. The cereal got caught in the tape joints of the disks. The disks were not spread out far enough. Many disks were too small so the cereal fell back to the bottom before it could be raised to the top. All the issues were fixed with tape and each screw successfully lifted at least one piece of cereal. We used 1 liter bottles. I think it would have worked better with bigger bottles. This was a more challenging project than I anticipated, but very rewarding. About two and a half hours were spent reworking the screws to get them to work. This proved to be a true lesson in engineering, science, history, and patience.